As the term ‘luthier’ may refer to the maker of a number of types of instruments, I will be focusing on my specialization: the instruments of the string quartet. The bow makers’ trade is often considered to be part of lutherie. Certainly one cannot function without the other, and the bow is a key factor in the quality of the sound produced. But I must stress that bow making is a separate profession with its own technical specifications. When we think of luthiers, we picture artisans surrounded by a sea of wood shavings, the workshop lit like a Vermeer painting or a Da Caravaggio. Luthiers—mysterious, secretive, passionate and patient—transform a simple piece of wood into a musical instrument. They then cloak the instrument with a bright varnish full of magical properties (wasn’t this Stradivari’s secret? ); and, as a final touch, they give true soul to the sound, bestowing on musicians the means to enchant an audience. This interpretation is certainly poetic, a touch mythological—but it describes just a tiny part of the luthier’s trade. Lutherie is a profession with many dimensions and areas of expertise, involving creation and also repair. Each of these areas requires a thorough knowledge of the history of violin making, which can be its own specialization entirely. Another key part of the trade is the collaboration and communication with musicians for sound adjustment, comfort of playing and instrument maintenance. 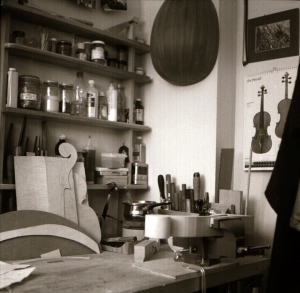 Each artisan must develop the skills that are essential to their individual ‘art’, from hand skills, careful observation, studying instruments and their makers throughout history, geometric layouts, mechanical and acoustic physics, the chemistry of varnish—in short, enough to fill the entire lifetime of a curious and meticulous luthier. And of course there are the administrative and commercial aspects of the trade, which are admittedly much less romantic but no less important. This web site exists to promote my work as a luthier. I hope it grabs your attention! Copyrights © 2014-19 Charline Dequincey. All rights reserved.